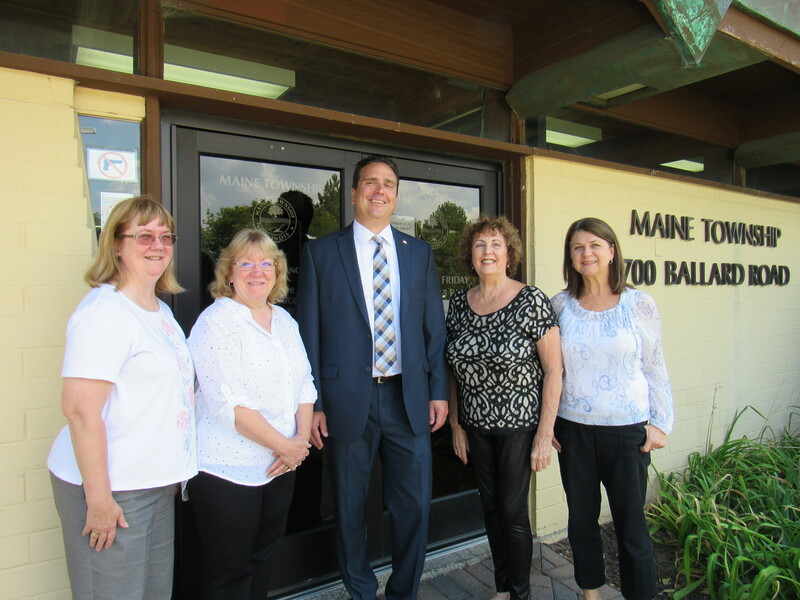 The Maine Township Clerk’s office exists to serve the needs of Maine Township residents. We do this in many different ways and are always finding new services to benefit our residents. Our office is within a fifteen-minute drive of any location in Maine Township. The Clerk’s office is also responsible for keeping the minutes of Township meetings and safeguarding important records for the Township and its Highway Department. One of the greatest privileges and most profound responsibilities we have as Americans is voting. The Clerk’s Office strives to register every eligible resident in the Township so they may participate in the democratic process. We have deputy registrars on duty five days a week, who will register any United States citizen and any seventeen year olds who will be eighteen by the next general election. Applicants must provide two forms of identification, one of which must prove their current address. Naturalized citizens must prove the date of their naturalization. Voter registration closes thirty days prior to any election and reopens two days after an election day. In addition to voter registration, all voters can pick up a Mail Ballot Application in the event they are not able to vote on election day. If you need information regarding polling place locations, election times and dates, or elected officials names, addresses and phone numbers we will gladly provide it to you. by 1) proof of U.S. citizenship, 2) proof of identity, 3) one recent passport picture (2″x2″ in size), and 4) appropriate fees. The fees are standardized by the U.S. Federal Government for all passport applications, thus, will be the same in Maine Township as any processing location. Note: It is very important that the birth certificate is certified by the County Clerk. New passport and renewal applications are accepted by our office Monday through Friday from 9 AM to 4:00 PM. No appointment necessary. For additional passport information, fees, and forms, please visit Travel.State.Gov. Clerk Peter Gialamas supports the Honor Flight Chicago by dedicating a portion of the yearly revenue from Passport processing fees. Groups of veterans partake in Honor Flight Chicago several times each year. The purpose of this program is to acknowledge veterans, and set aside a special day dedicated to honoring, remembering and celebrating their service and sacrifice. Applications are available for seniors, age 65 and older, to apply for the new Transit Permit – VENTRA card. The new fare payment system Ventra is a convenient way to access and pay for Metra train and bus rides on CTA and PACE. Applicants must verify their age by supplying a driver’s license, state ID card, passport, or resident alien card. The Seniors Ride Free program will be limited to low-income seniors who will met the income requirements set by the State of Illinois Department of Aging – Benefit Access Program. Seniors who are not eligible for the Benefit Access Program will be eligible for a Reduced Fare Permit to ride public transportation. Low Income Seniors must first apply for the Benefit Access Program. The Cook County Department of Revenue is going live May 2019 with the new STICKERLESS Wheel Tax Liability Notice Process! There will be NO MORE PHYSICAL STICKERS/TAGS. Qualifying Senior Citizens/No Fee Categories will not be required to register. Remit payment by utilizing your Renewal Wheel Tax Liability Notification. Payments accepted online, by mail, in-person at Department of Revenue and 100+ participating ELS Currency Exchange locations! Please visit cookcountyil.gov/revenue for more details. Residents of unincorporated Maine Township may purchase the Republic Services solid waste, recycling and yard waste stickers in our office. The stickers may be purchased Monday through Friday, from 9:00 AM to 5:00 PM. Temporarily injured? The Clerk’s office issues temporary handicapped parking placards to qualified individuals who submit an application signed by their physician stating the nature and duration of the applicant’s disability. Applications are available at the Clerk’s office. Handicapped parking placards are issued immediately upon receipt of a properly completed application. Our office will refer people in need of longer-term parking privileges to the proper state agency. Outdoorsmen are invited to visit our office whenever they need Illinois hunting, fishing, or trapping license, which is issued electronically. We also supply trout and salmon stamps, habitat stamps, and migratory waterfowl stamps. Discounts are available to seniors and to those who purchase licenses for both hunting and fishing. Super Senior Fishing and Hunting licenses for residents age 75 and over shall be $1.50. Additionally, the fee for fishing and hunting stamps shall be $.50 each. We will also provide you with the Illinois Regulation books. The Clerk’s office provides free notary public service. If you have a document needing notarization, please bring it to us and one of our notaries will make it official for you. The Clerk’s Neighbor-to-Neighbor program reaches out to the new families who move into Maine Township. Packets are available to new residents containing information on all services provided by Maine Township. In addition, information is provided regarding the Cook County Sheriff’s Department, the North Maine Fire Protection District, Maine Township Public Schools, area churches, north and northwest suburban hospitals, and local Neighborhood Watch programs. Stop in the Clerk’s office to pick-up your free informational packet. Please come and see us before you take your next trip. We provide, at no charge, Illinois State maps and Maine Township maps with street guide.